*5000 CLOSING COST CREDIT OFFERED (SUBJECT TO CONDITIONS)* Stunning complete top-of-the-line remodel with unadulterated mountain & meadow views! The floor plan of this home was opened up to live like a 2-Story & features 3 generously sized bedrooms on the upper level plus a potential 2nd master bedroom suite on the lower level. The main level opens to expanded wrap-around deck with red cedar decking and overlooks the community greenbelt which the local Elk herd uses as a thoroughfare. Enjoy the outdoors with 2 fully usable acres directly accessed from 3 of the 4 levels in this home. 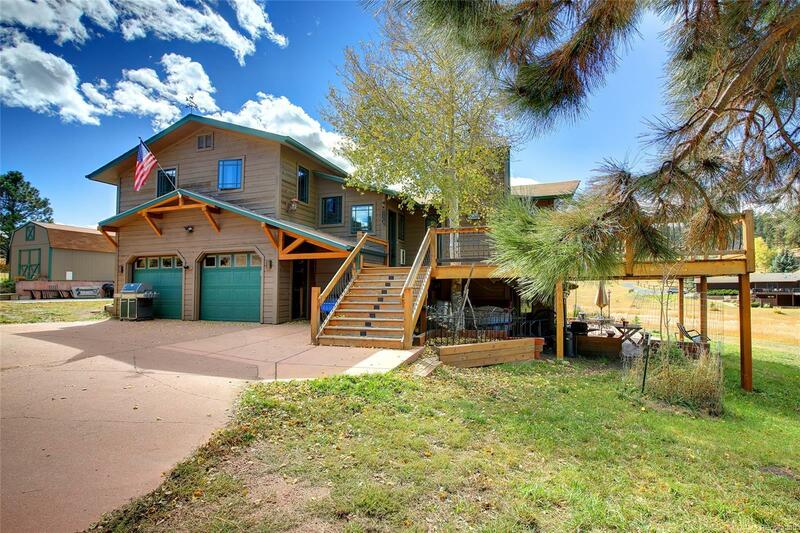 Sweeping mountain views, incredible sunsets in a peaceful & quiet setting. The property remodel design is prepared for the addition of a 3rd car garage. The remodel was thoughtfully completed with hidden features & high-end finishes inside and out. Highlights include addition of skylights; custom stained solid Aspen doors; tongue/groove ceilings/walls; new kitchen and baths with granite, tile and stainless. Selling Office: Colorado Clockwork Realty, Inc.